Meisterwurz aka Masterwort In the late Middle Ages was the Meisterwurz as a panacea, as one can easily see from the name. It was highly revered and was used not only for medicinal purposes, but also as a magic root. Later the Meisterwurz forgotten, perhaps because they can be so easily confused with other parsley family. Only when Hildegard von Bingen and herbal medicine was rediscovered, also got back the interest in Meisterwurz that may have been highly appreciated by Hildegard. Masterwort may be used similar to the angelica (Angelica). You can cook a tea or use it as a tincture. Also a wine you can bring to the boil with the Meisterwurz and then take him to upset stomach. For a Meisterwurz tea poured over one to two teaspoons Meisterwurz with a cup of boiling water and lets him go ten minutes. Then strain and drink the Meisterwurztee in small sips. From this tea you drink a day to three cups. As with all potent medicinal herbs you should take a break after six weeks of continuous use and temporarily drink another tea of ​​similar effect. Then you can drink for six weeks Meisterwurz tea again. By break any adverse long-term effects are prevented and the desired Meisterwurz-effectiveness is maintained and not be by getting used to. To establish a Meisterwurz tincture itself, douses you Meisterwurz in a screw-top glass with double or grain alcohol until all parts of the plant are covered, and can pull the mixture closed for 2 to 6 weeks. Then strain and pour into a dark bottle. From this tincture is taken one to three times daily 10-50 drops a. If a tincture is too concentrated, it can be diluted with water. The tincture is used to strengthen the digestion and colds. If complaints are running particularly early through menopause, can Meisterwurz tincture alleviate them. Masterwort tincture can also use it to dab the gum with bleeding gums. Also for the other fields of application of Meisterwurz one can apply the tincture internally or externally. -For coughs and bronchitis can perform a steam bath with the Meisterwurz. To this add one or two tablespoons of finely chopped root pieces of Meisterwurz in a heatproof bowl and pour over it with about 1 liter of boiling water. The bowl you over to a table. Then bends it over the steaming bowl and attracts a large towel over his head and upper body, so that the steam is retained. The hot steam is inhaled 10 to 15 minutes. Is then dried off thoroughly. With Meisterwurz powder can prepare a poultice. To this add some warm water to the Meisterwurz powder and turns it into a porridge. This slurry is added to poorly healing wounds, ulcers or abscesses. Then you put a compress on the pulp and fixes the poultice with a bandage or plaster. Thanks to the essential oils which Meisterwurz acting expectorant and facilitates breathing. The antibacterial effect helps heal bacterial bronchitis. The same mechanism also helps in poorly healing wounds, inflammation and other bacterial infections. Among other things, the bitter substances and essential oils digestion is stimulated and promoted the bile production. Bloating can be alleviated. Because of Furocumarine skin contact with the Meisterwurz may act irritating to skin in sensitive individuals. Therefore, allergic reactions are not excluded. The smoking by the roots should expel witches. In Tyrol was smoked for this purpose traditionally at Christmas time with the master root. If you wear the root with it, to give the force. Both the physical strength and the willpower should be strengthened. Cows and horses were fed, among other things with the Meisterwurz to calm her. In medicine antiquity Meisterwurz was unknown, probably because it is an alpine plant and is not native to the Mediterranean countries. Whether Hildegard von Bingen knew the Meisterwurz is controversial today. Perhaps with the plant, which they knew as Astrencia, not Meisterwurz but the Astrantia major meant. Starting no later than 1560, the Meisterwurz however, is known as a medicinal plant and is highly valued. They used since then until the 19th century in many applications, including as part of Universalheimitteln, eg in Orvietan, a late modification of Theriaks. Popular were ointments, tinctures, powders, pills, decoctions and teas from the Meisterwurz. On behalf Meisterwurz you can tell how much the plant was originally estimated. For several centuries it was even considered a panacea. Because it was for centuries also like to grown in gardens, there are also in the highlands or lowlands sometimes wild specimens of Meisterwurz. These escaped some time ago the gardens of local residents. Masterwort grows in the Alps, Pyrenees and other mountain ranges in central Europe. It belongs to the carrot family and is similar to angelica. In ancient times, the Mediterranean, the Meisterwurz was unheard of that suggests that they never grew up. In Central Europe, it has, however widespread, probably because it was grown in the Middle Ages in many gardens and then wild. It prefers moist meadows and stream banks more than 1,000 meters above sea level, in order to grow. Even in places where the snow in the spring will be a long time, the Meisterwurz thrives. Especially often find the Meisterwurz on the so-called Hochstaudenfluren. Masterwort The Masterwort is up to 90 cm high. It has ovoid, lobed leaves that are notched at the tip. 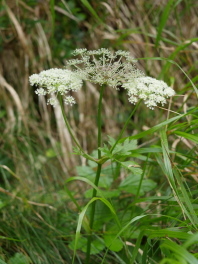 Its flowers are flat, white or pale pink umbels that bloom in July and August. Attention! For people with sensitive skin, the contact with the Meisterwurz meadow dermatitis can trigger. Since the Meisterwurz is a mountain plant, they do not always thrives on particularly warm locations in the plane. In cooler areas, or in the highlands, the chances are better that the Meisterwurz feels comfortable. Masterwort needs a moist humus possible location in the sun or in partial shade. The easiest is the propagation by division of rhizomes in the fall. You can also buy ready-made plants commercially. The cultivation of seeds is troublesome because the Meisterwurz and the seeds thus need a cold period before they germinate. But even with enough cold they germinate only hesitantly. Attention! In some areas the Meisterwurz is protected and may not be harvested. Since the Meisterwurz very easily with other parsley family, including the highly toxic hemlock, could be confused, you should collect, if you're absolutely sure with the determination only. The whole plant, especially the rhizome smell strongly spicy and aromatic. The fragrance is between angelica and celery. By comparison, the hemlock smells more strong! In the late autumn or early spring you can dig up the rhizome. Parts thereof is allowed to remain the best in the earth, so that the plant can re-sprout later. After harvesting, the root parts are washed, cut and dried in a dry and shady place.